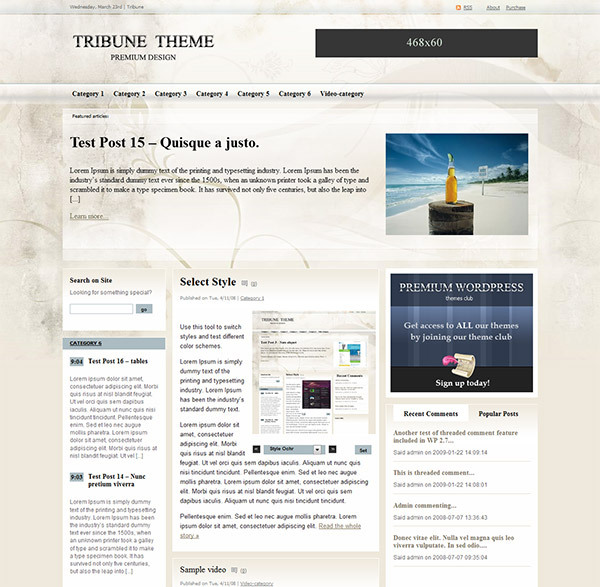 An exiting new type of wordpress theme with a fully transparent background is available for you. Now you can easily change the background image creating as many variations and looks as you wish. A sleek and simply portal layout of Tribune combined with stylish glassy transparent and independently configurable elements provides a lot of possibilities for the image of your site. Beautiful and powerful transparent design, new features and advanced functions make it really special, which makes Tribune stand out from other themes. The theme comes with a featured articles rotator lets you scroll the posts from Featured category without refreshing the page; a recent comments/popular posts tabber to emphasise your most important posts; a completely widgetized sidebar with custom widgets included in the theme packaging, completely CSS color controlled, offering you the most flexibility and the easiest customization, allowing you to change the colors of your entire site on the fly in seconds. There are also 11 custom widgets and 7 different styles to choose from. The theme has a SEO Optimised Layout with custom SEO settings, so you can optimize each post as well as an easy Banner and Adsense management.